Back in July, the Nunavut Liberal Party announced their candidate for the 2015 Federal Election - and Finding True North was there for the announcement! And their choice? 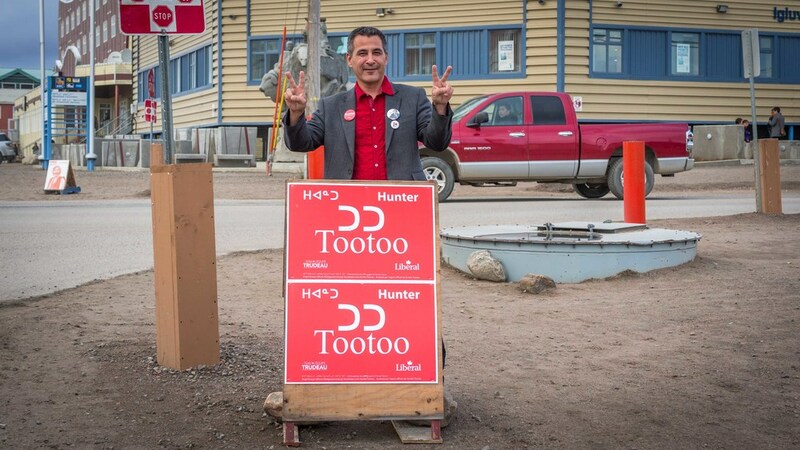 Hunter Tootoo, seasoned politician and cousin to another well-known Tootoo, Jordin. The Nunavut Liberal Party candidate is now leading the charge for the Grits in the territory - at least until Justin Trudeau comes up here again. To continue with our election coverage, I met with Hunter yesterday at Baffin Deli. Our interview was delightfully delayed by calls of, "Hunter! Hunter" as well-wishers, supporters, and even tourists came over to get pamphlets or say hello. Once the greetings were all over, Hunter and I spent the next half hour talking campaigns, communication, and competition. Here's what that sounded like. FTN: In 1997, you ran for the NDP. Did you consider running for the NDP in this election? TOOTOO: No. Actually, when I ran in ’97, that was almost 20 years ago. It was just prior to division and there were a lot of things that I don’t think were being addressed at the time. And I took the opportunity to run then. I knew I wasn’t going to win, but just to be able to get some of those ideas out there and get people thinking about them. Why did you not run for the NDP this time? Well, I really like Justin Trudeau. He’s very charismatic. He’s a good leader. He’s a good listener, which I think is something that’s key for any politician. I think some of the ideas and stuff that he and the Liberal Party stand behind or are putting out there are, for me, going to best serve Nunavummiut. What are your campaign plans as the Liberal Party candidate for Nunavut? I’m going to be starting to travel hopefully on Saturday. I didn’t want to get out too early, because then people forget about you. And in the summer, a lot of people aren’t in the communities...so I figured I’d wait and put the push on now in the last month or so. That’s when people are thinking about it a lot more, they’re talking about it a lot more, they’re much more engaged. Which communities are you planning to visit? As many as I can. Hoping to do a bit of a Baffin tour, Igloolik and Hall Beach and Cape Dorset right off the bat. And hopefully up to Pang and Clyde River. I’d like to get to some other communities in the Baffin as well as time permits, but I want to get over to Rankin Inlet, the Kivalliq region, my hometown, and Arviat and Baker Lake. And over to the Kitikmeot as well. How do you think you can reach all or as many Nunavummiut as possible? I’ve been just putting stuff out there, releases, you know. My contact information is out there. The first part of this campaign has been on the phone quite a bit. I find that’s more effective, you know, talking to people in the different communities all across the territories. Speaking of communication, one issue that some Nunavummiut have flagged is your fluency with Inuktitut. What is your response to that? For my 14 years as an MLA, that’s something that I faced right from day one. I served as the MLA for Iqaluit Centre for three terms and a lot of people in my riding were unilingual, and they voted for me. They had the faith and trust that I can bring their issues forward as well, regardless of whether I spoke Inuktitut or not. Something that you hear a lot up here is [that] French language services always seem to get more money than Inuktitut language services. And I’ll be pushing for more funding for Inuktitut language services, so that more young people across the territory don’t end up in the situation that I’m in, where I’ve lost my language. That’s a great Nunavut-specific issue – funding for language preservation. What are some of the other platform issues that you feel strongly about? Nutrition North. Your bread and butter issues, right? There was a survey that Health Canada did and I think it was like 70% of Inuit families are food insecure. * Everybody and their dog up here knows that the Nutrition North program is not working. That message seems to be falling on deaf ears. They’ll put a little advisory committee together, and...force retailers to invest in a very expensive point of sale system to be able to put on your receipt how much the subsidy was. That doesn’t do anything to help lower the price of food in the territory. If anything, the additional cost of putting in those point of sale systems is going to be passed on to the consumer. I think the Auditor General called the Nutrition North program an abject failure. And everyone up here knows that. The Liberal Party is committed to doing a complete overview of the program. They’ve said it needs to be expanded. One of the things that I think also needs to be looked at is the level of funding. They’re saying I think it’s around 60 million dollars right now, but it’s capped at 60 million dollars. That program in the past cost the Federal Government anywhere from 90 to 110 million dollars a year. So I would go back and look at the program historically and see what it actually cost the government. The amount that it’s at now under the Harper and Leona government is actually less that what was historically run through the program. And one of the other things with that program is that, people used to be able to order from suppliers in the south on their own. That’s gone now. They’ve made the program so cumbersome that retailers and suppliers in the south don’t want to participate anymore. So basically they’ve taken away Nunavummiut’s choice of where they want to shop. It could be done very easily, some regulatory changes to the regulations of the program, to open it up and expand it so that consumers across Nunavut have more choice on what they choose to buy and where they choose to buy it from. You brought up a really good point, which is that everyone and their dog knows that we have poverty issues or food insecurity issues up here. But often, Nunavut feels ignored by the south and by Ottawa. How will that change under a Liberal Government, and how do you think you in particular will be able to advocate for Nunavut in Ottawa? I think right now, not only everyone in Nunavut but everyone in the country realizes that the Harper Conservative government is a one-man government. A lot of people have told me they don’t think Nunavut has a voice in Ottawa - Ottawa has a voice in Nunavut. People have known me over the years in my political career. I’m not afraid to say what needs to be said, even if it’s unpopular. But the way I look at it, people, they put their trust in me to be able to ask those tough questions, raise those tough issues, and that’s something that I take seriously and I will continue to do. The one thing I really appreciate about Justin Trudeau [and the Liberal Party] is that it’s a team; it’s not a one-man show. I met with him, he knows my history as a politician, and he welcomed me. He said he was looking forward to me being a part of his team and working with me, because he wants to have a strong voice for the north. To me that says a lot right there. He wants me to be able to raise issues that are important to the people who have put trust in me to represent them. If Justin Trudeau becomes the Prime Minister of the country, how do you think having him as a leader will specifically affect Nunavummiut? Where to start? Justin, he’s got an intimate relationship with the North, for years, since he was a young kid coming up here with his father Pierre. He knows the North and he loves the North, and he appreciates it as well. He also appreciates us, that we live up here, and respects our views. He’s made a commitment to close the gap and be inclusive as far as the Aboriginal people of this country. To ensure that their voices are heard and respected. Even his commitment to infrastructure - that’s one thing for years, when I was a regular member and a minister, one of our asks to Ottawa was always funding, long-term stable funding for infrastructure...with his infrastructure announcement, he’s given us that. And it’s not like, "Okay we’re going to put a heritage centre in Gjoa Haven and this here and that there." His approach is that the territorial government can decide on what its priorities are for infrastructure and we’ll work with them to help achieve that. So it’s, "you tell us what you want, and we’ll help you get it," instead of "this is what you’re getting," which is what we get right now under the Harper Conservative government. How would you describe the relationship between the territorial government and federal government right now, based on your experience at various levels of government? The times I’ve been [with the territorial government], we’ve always asked for certain things, and we just kind of had to wait and see what they’re going to dole out for us. You look at the last Federal budget; there was absolutely nothing in there except for basically a credit card limit increase and that’s it. Well, you go ahead and get yourself into more debt, and that could get us in trouble down the road. How do you see the relationship between the territorial government and the Feds changing under a Liberal government? Justin recognizes that there is a huge infrastructure gap. He’s committed to creating more childcare spaces, recreational facilities for elders. And there’s a whole green energy component to it as well. I think all those things are things that the territorial government would be just happy with. That falls right in line with a lot of the priorities and challenges that they’re facing right now, and trying to find ways to address. I’ve served in our Legislature with our current Premier and almost all the cabinet minsters that are there and a lot of the members that are there, so I’ve always had a good working relationship with them and continue to do that. I’ve worked right alongside them trying to push for some of these things that we’ve been pushing for, for years. And that’s Justin’s approach; working together we can get things done. He’s trying to rebuild and foster a better relationship with Aboriginal people in this country. He’s made a commitment to close the gap on education and I think his announcement this morning on jobs and training will help in that. Getting people trained and able to enter into the workforce, it will help close the social and economic gap that exists there as well. There are lots of factors that influence election outcomes. Regional allegiances, splitting of the vote - especially left of centre. All things considered, which of your opponents is most concerning for your campaign? I’ve always said I tip my hat to anyone that puts their name forward to run for public office. It takes a lot of courage to do that. You’re out there and you’re potentially a target for anybody. I think right now, from everything I’m hearing from all across the territory, people want change. People want real change. I want to be Nunavut’s voice. I think Nunavummiut need to have a choice to make. But who do you think is your biggest competition? I can't answer that. Everyone’s out there running based on themselves and what they're putting out there and what they have to say and what they have to offer and people make their choice. And whether I run into someone who says, "Oh no, I’m going to be supporting this party or that party," I say that’s fine. You have to respect the individuals' right to choose, and same thing I said in all my territorial elections: doesn’t matter as long as you get out and vote. And if I end up being the successful candidate, I'll be there to represent you regardless of who you supported, because to me, as long as people get out and vote, they’re exercising their right and they deserve to be heard. That’s something I’ll always stand by. Don't forget to check out the rest of our election coverage, including our exclusive interview with Justin Trudeau. *Mr. Tootoo is likely referring to the Inuit Health Survey, which was not done by Health Canada but by researchers from various universities and organizations. The statistic of nearly 70% of Inuit families reporting not having enough to eat holds true.